The name Citàlune is a colloquial shortening that popularized over time; the full name, which is not said much anymore, translates to “city of the setting sun & rising moon.” The land is known for its beautiful sunsets and clear starry nights, and for its two prominent royal families whose power and influence have waxed and waned over time. Estel’s royal symbol is the moon, and Lyra’s is the sun. For now, they each have influence over their respective lands, and have their own courts and residents who are loyal to them. They have priorities and values that are vastly different, but in a way, compliment each other and work together to make the entire city have a place for everyone. The focus of this post is the Moon-side of the river that Estel rules over, which is more calm, quiet, natural, and woodsy than the other side. Estel values peace and tranquility, the conservation of nature, and providing public services to residents in her moon castle. In the past few years, I’ve experimented with different ‘framings’ for Estel’s castle, like streetlights, or just one tree on either side. But I went back to two trees framing the castle on either side, which I had in the early days of my town, and I’m glad I did! My favorite, classic view of Estel’s castle ^^ I can never resist panning up to see this view on a starry night. This is the center of Estel’s garden, which as a whole is supposed to have a formal French garden look. Estel is all about providing services for the townsfolk, so her castle’s landscaping is her way of giving residents a public park to wander and relax in, and to take in the beautiful mixture of nature and order. The bottom of the garden has statue fountains mirroring those from the top half, then the hedges open up to a pair of benches overlooking the ocean. Here, the path starts to break away a little, signifying you’re leaving the formal garden into more casual/woodsy territory. I made cracked half-marble pieces specifically for this area, and tried my best to blend them into the unique spaces (part dirt, part grassy) they’re placed on. The main 2×2 pattern has a full moon of bright marble as its centerpiece, while the rectangular 2×1 pattern has crescent moons. The moons are surrounded by a sky of blue and purple mosaic pieces, speckled with white starry pieces. Crossing that bridge takes you to the center of Citàlune, where you’ll find a moon garden ringed by trees and water. Some river views that often go un-photographed 🙂 I feel like the river being so close on the moon side of town has limited the space and made it tricky to work with, but I do enjoy the natural atmosphere the river adds to this side of town: seeing the water peak through the trees, hearing the water flow as you walk along the path. Between the sun and moon beaches, the moon side is probably my favorite. It’s not too big, not too small; it has the dock and a few cozy nooks along the clff; and I love the peaceful atmosphere given off by the white flowers. The moon side of town is a bit more sparsely populated than the more city-like sun side of town. Two of its residents are Julian, a member of nobility in the moon court, and Bruce, a hermit who enjoys the peace and quiet. Here is Violet on the trail to her home, where the air is hung with the sweet aroma of wisteria and violets. The lonely witch has made her mark on the gardens in her nook of the forest, but also lets things grow wild. Violet’s cottage is nestled deep in the woodland, next to the largest lake in Citàlune. Most residents give her home a wide berth, though Violet means no harm and would actually enjoy having guests on occasion. One reason why most residents avoid Violet’s home is that it’s rumored she lives in an area of the forest dense with fairies, who aren’t always kind to strangers. 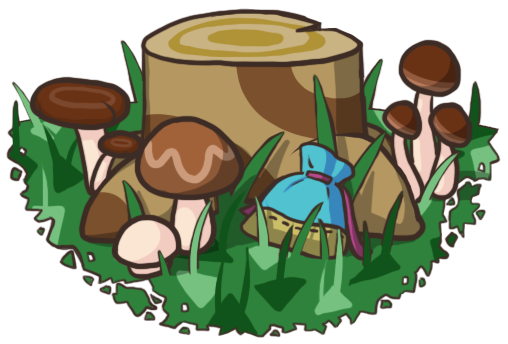 Violet has a working relationship with some of the fairies, and has met with them to trade magical artifacts before; this seemingly ordinary old stump is one such meeting spot. The same dirt trail dotted with stepping stones continues south below the main path to lead travelers to Fern’s Tavern. Violet will sometimes walk the trail connecting their homes, for Fern is one of her few friends. Then they catch up and share tales together in the main hall of the Tavern. Fern’s Tavern has humble accommodations, but travelers know it’s much preferred to spending the night in the wilderness. The busiest days of the year at the Tavern are when fairs and festivals are held at the town tree clearing nearby. A special sapling was planted in the forest long ago, which grew into a tree so large that it became symbolic and significant to Citàlune’s culture. Its roots spread far and deep enough that a natural clearing in the forest formed around the tree. Throughout the year, merchants set up tents full of wares from faraway lands, and fairs and festivals are held that attract a variety of travelers from all over. Lights and lanterns are hung from the trees around the clearing since the revelry often lasts long into the night. As the night wears on, travelers will often try to find an open room or bed at Fern’s Tavern. The clearing is also known for its beautiful star-shaped flowers and crescent-shaped pond, which are said to be blessings from the forest in return for planting the sapling that grew into the town tree. And lastly, this is the bridge that will take you across the river to the sun side of town! ☀ But we’ll wait to cross the bridge until the next part of our tour. 🙂 Thank you for reading! 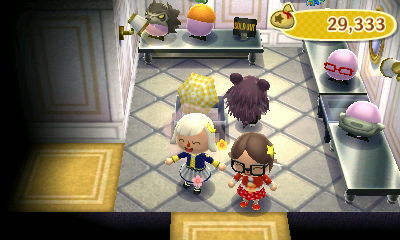 Posted on July 3, 2018 by Amy •	This entry was posted in AC:NL, Citalune and tagged Animal Crossing. Bookmark the permalink. I absolutely love the concept, from start to finish. I think it’s genius how you incorporated some of the game’s details to make a story! (Like how you made the watered flowers near the stump in Violet’s home a tiny home for sparkly fairies. I don’t know, I just love that detail!) Seeing how beautiful this town is now, it makes me really inspired and happy! I feel like I slowly watched a town grow in the distance from the moment we first bought ACNL from its release until now. 😀 Heck, this isn’t even a town…. it’s two magnificent kingdoms all in one place! What a big transition! Wow, Amy! 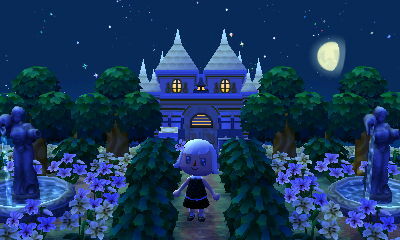 I feel so lucky that I got the chance to visit Citàlune the other day, it truly is a spectacular town. I’m even more blown away now that I get to read the rich storyline you’ve created for it! I’ve always loved the two kingdoms concept you’ve had going on, but I could have never imagined it would blossom into such a breathtaking work of art! I have a real soft spot for towns with a storyline, and at this point Citàlune could have an entire novel written about it. Definitely one of my favourite towns of all time! Wow, you have made your town stunningly beautiful! I can clearly see all the love (and time) that you have put into the town, which I’m super impressed by. Looking forward to seeing the rest of the tour, and after that I’ll probably swing by in a dream. Awwww… but hey, just paid off and opened the Dream Suite, and will download the update and catch Citalune in a dream the next chance I get! Thank you for motivating me to finally update! WOW! this is truly amazing! How did you do the.crescent-shaped pond? This is so cute. I decided to check your blog again after a while, and wow am I amazed! Your town looks so beautiful and detailed, I’ll have to visit sometime! I’m just getting back into NL again and seeing that Citalune is complete makes me so happy. I have to appreciate how much dedication and effort you placed into executing the celestial themes and the overall magical atmosphere, and this is only half the town! 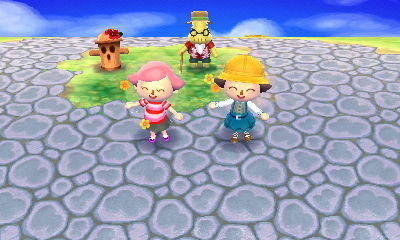 Ahh, you’re making me want to complete my other town so badly ^^; Can’t wait to tour the sun half of Citalune! Your town is amazing!! Seriously incredible! It makes me want start my town over and finally act on the fairy tale theme I’ve been thinking of for a while. A question though, in Fern’s bedroom, what song is playing on the music box? I love it and I don’t think I’ve heard it before! Thank you so much! This is a really sweet comment, I appreciate it 🙂 ❤ Good luck on your fairytale theme town, it's a fun theme to work with! Fern's music box is Steep Hill. I really like how melancholy it sounds as a music box, perfect for an innkeeper to unwind and relax after a long day of assisting inn guests. I decided I can’t part with my “normal” town (mostly because it has the cafe, police station, campground that I won’t have in my fairy tale theme) so I’m just going to get another copy of the game, haha. I can’t wait to get started! And thank you! I agree, it really fits the theme of Fern’s character so well. You put so much thought and effort into this and it really shows. 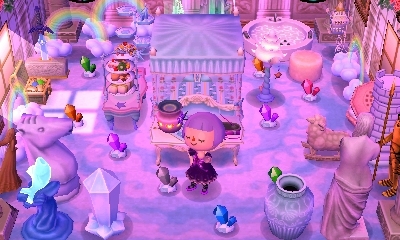 Thank you for sharing your gorgeous town with us, and I’ll probably stop by in a dream from time to time just for Citàlune’s calming ~aesthetic~ (considering my FT themed town will have some dark undertones). Hi! Your town is absolutely amazing! I hope this does not offend you, but I am trying to copy your town in my own town 100%, and it’s going great so far! My only problem is, by the windmill next to fern’s house. There is a book (the lost item one) and since you cannot drop them or place them in the save editor, I was wondering how you got it there? Hi again! Sorry to bother you, but where is your cafe? If you don’t have one, where should I place it to look nice? Hi there! I’m not sure if you’re active, but your town has been a big inspiration for me as of late! Everything’s so perfect and leaves me in awe! I’ve been still developing my town but I’m hoping to make it as pretty as yours! Hi! Thank you so much, this is an incredibly sweet comment. I’m so happy to hear my town was an inspiration for you 🙂 Good luck and have fun developing your town! Hi there! Me again, I was wondering what time and date your dream address was set on! I love the rare purple sunrise, and I know it is sometime in early summer, but I am not sure I can find when it is. It is really pretty and I would like to play in my town then! Also Merry Christmas / Happy Hanukkah! Thank you! Merry Christmas, and a good holiday season and new year to you too! ^_^ My town is set at 6AM on May 17, 2013. I had to specifically look for a purple sunrise date because I don’t play often enough naturally at 6AM. Everyone’s weather events are different, though, so your May 17, 2013 might not be a purple sunrise at all. I’ve found the purple sunrise frequently in the spring, but never during the cherry blossom festival. So April 11-June 27 at 6AM would be a good time period to look for one in.